THE ULTIMATE AEG CONTROL SYSTEM! Transform your Tokyo Marui Next Generation AEG into an advanced training weapon system. 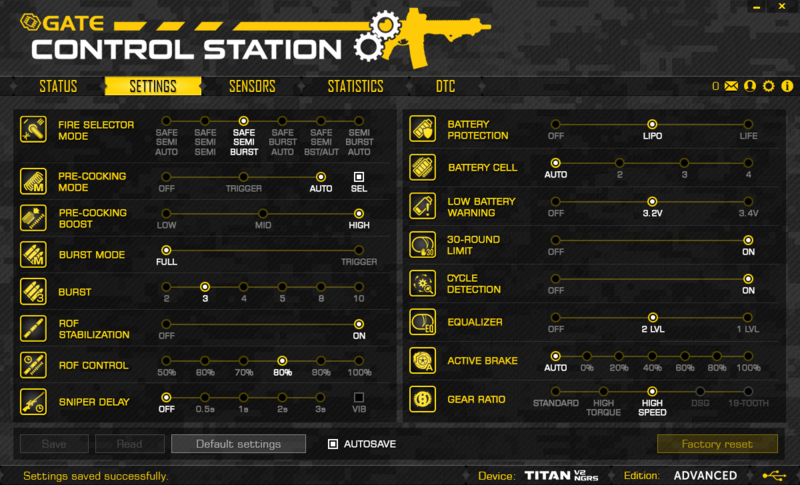 Adjust your weapon and check the Statistics using USB-Link and GATE Control Station app for PC, MAC and Android devices. TITAN V2 NGRS has the whole new trigger sensor, which allows to set hair trigger with ludicrous precision: even 50 sensitivity levels for first millimeter of trigger movement. The innovative 3rd generation trigger sensor offers you even 460 possible sensitivity settings. Gain a unique tactical advantage thanks to the extremely fast trigger response and lots of other useful functions. Boost your AEG with computerized technology. Give your AEG a new lease of life! Why TITAN V2 NGRS is so special? "Thanks to the optical sensors we have eliminated the problem of faulty switches that can occur in competitors' drop-in mosfets. The trigger has no mechanical connections with the PCB. This eliminates mechanical stresses and provides for high reliability." With the GCS you can easly calibrate and adjust sensors. The selector sensor gives you an option for fine calibration of selector switching point. You can also turn off / on bolt catch function. Thanks to the precise 3rd generation trigger sensor you can set trigger sensitivity with ludicrous precision: at least 50 sensitivity levels for first millimeter of trigger movement. Depending on trigger construction, it enables even 420 possible sensitivity settings. You do not have to disassemble your AEG. Just use the GATE Control Station™ App and adjust the trigger to your preferences and level of skills. Bolt catch sensor supports empty magazine detection, what gives full compatibility with Tokyo Marui V2 Next Generation Recoil Shock. Thanks to the dual gear sensor, TITAN precisely detects in which position the cycle should finish - even in case of Infinite Torque-up gears or TM NGRS gears. Therefore, even the shortest trigger action produces at least one full cycle. FULL CYCLE - when the pre-cocking is off, TITAN ensures that the gearbox completes a full cycle. You gain a higher reliability. Victory in the game is often a matter of fractions of seconds. Thanks to PRE-COCKING, you gain a trigger reaction similar to a real gun. It allows for initial spring compression, which speeds up the trigger response significantly. TRIGGER MODE – slow trigger action compresses the spring, and fast trigger action fires the shot. Please note: using PRE-COCKING increases wear and tear on the gearbox. The burst enables you to shoot a pre-determined number of BBs, which is very useful in MILSLIM and when using low-caps. * There is no need to set burst time. You can easily set burst between two and 10 shots. This enables a reduction in a gun's rate of fire. You use stronger LiPo batteries, and still have a ROF just like in a real gun. ON - ROF Control uses PWM to decrease ROF. Thanks to this, gearbox works smoothly what decreases wear and tear of AEG internal parts. OFF - ROF Control adds breaks between shots to decrease ROF. It gives you more realistic experience. 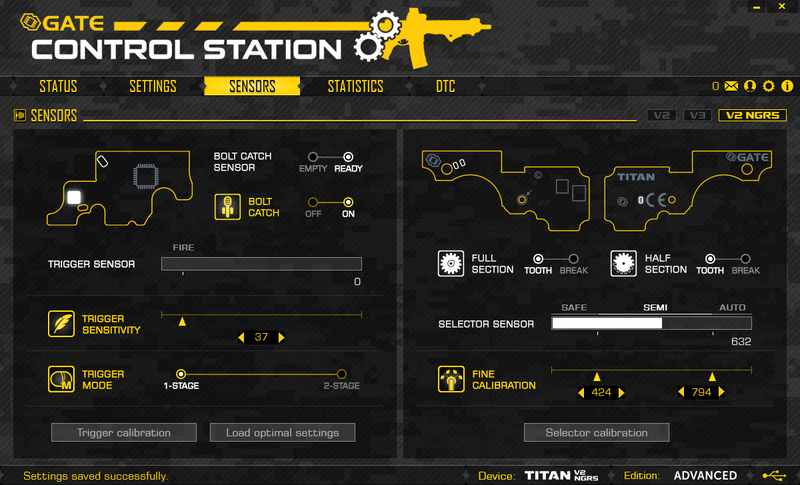 It lets you to set delay between each SEMI shots to simulate the delay from reload or recoil. You can set 0.5s, 1s, 2s or 3s delay. We know how vital the fast trigger response is during combat. This is why we have developed the Smart Trigger function. It enables you to achieve a faster trigger response. It works with the ROF Control System. During the first shot, the microprocessor sets the ROF Control to 100%. After the first shot, it switches to a previously programmed value (e.g. 50%). As a consequence, the first shot is fired at a full ROF, and subsequent shots at a reduced ROF. The best results can be achieved by using a battery with a higher than standard voltage. For example, if you use a 7.4V battery, you can replace it with 11.1V. In this way, you will achieve a faster trigger response with the same rate of fire as with a standard battery. Works only when ROF STAB is ON. Enjoy two stage trigger. Activate AUG Mode and set two different trigger sensitivities. Pulling the trigger slightly produces SEMI or BURST fire and pulling the trigger further produces BURST or AUTO fire (depending on the fire selector mode). Protection against Over-Discharge of the Battery. Modern LiPo and LiFe batteries are very sensitive to over-discharge. If you do not want to damage the battery and you care about its service life, this protection is indispensable. The microprocessor monitors the battery voltage constantly. When the voltage drops down to a critical level, it will not allow firing. *TITAN detects the number of cells automatically. 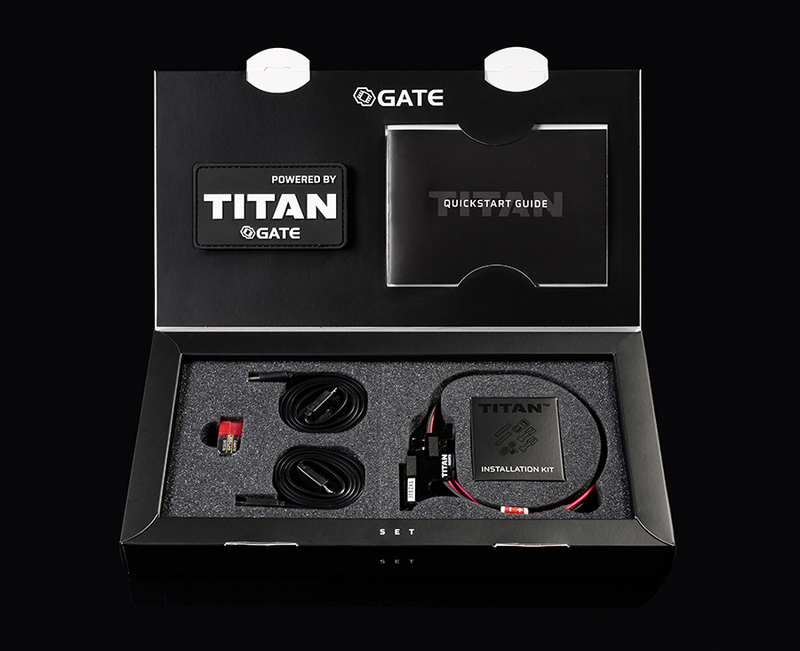 There is no need to reprogram TITAN every time you replace the battery. When the battery voltage drops to a predefined level, the motor will vibrate at regular intervals. It automatically adjusts the motor's braking power according to your needs. This prolongs the lifespan of the motor. There is also an option to set the motor braking power manually. Do you want to achieve a higher ROF and faster trigger response? Are you planning a power upgrade of your gun? In that case, you need a MOSFET. 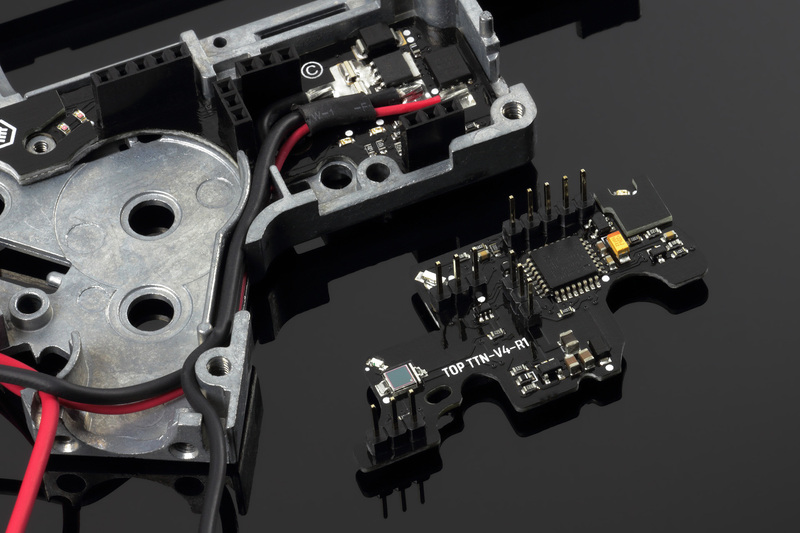 It targets the energy from the battery directly to the motor, bypassing the mechanical trigger contacts. As a result, you gain a higher ROF of the gun and a faster trigger response. This allows you to quickly check whether the drop-in module is working properly. It helps to locate where the problem lies when anything goes wrong. Thanks to its special conformal coating, our product is resistant to atmospheric conditions (Military Specification MIL-V-173C). 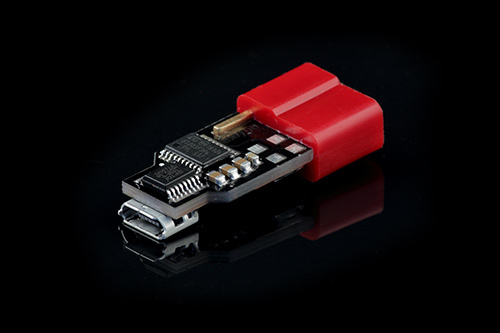 The drop-in module can be used with batteries up to and including 14.8V LI-PO. The minimum operating voltage is 3V and maximum is 17V. Make your adventure start more easily with a new product. The quickstart contains basic information and hints.